Former F1 driver Heinz-Harald Frentzen looks into the role the safety car plays during a grand prix. Ever wondered what happens back at the factory when the team returns after a race weekend? Well, wonder no more as Red Bull take you behind the scenes at Infiniti Red Bull Racing to follow Christian Horner as he gets to grips with the Monday after Italian Grand Prix. What’s discussed within the team? What’s planned for Singapore? What are the Team’s next steps? And most important of all, what exactly appears on Daniel Ricciardo’s expense claims sheet? Ho-Pin Tung is a Chinese racing driver who has competed in a range of motorsport series around the globe. Tung spent his early years in the Netherlands and began karting in 1997, winning the Dutch Cup in 1999. After spending a few years in Europe competing in a number of Formula Ford series, Tung raced in the Formula BMW Asia series, winning the series at the first attempt. As a result, Tung tested a Williams F1 car in December 2003. The following season, Tung graduated to German Formula 3 and to won the championship in 2006. That year, Tung also represented Team China in the A1 Grand Prix championship and finished on the podium in the second Australian race. Between 2007 and 2010, Tung raced for a number of teams in GP2. He came second in the sprint race of the 2008 Monaco GP2 round and finished 18th in the championship that year. In 2009 Tung took part in Superleague Formula, racing for the Atletico Madrid team in the first half of the season and Galatasaray, winning one race. In 2009 Tung tested for the Renault F1 Team and was made the team’s official third driver early the following season. In 2011 Tung made his IndyCar series debut for Dragon Racing and finished 27th at Sonoma. Tung began racing in the Porsche Carrera Cup Asia in 2012 and has become a regular race winner. He made his debut at the Le Mans 24 Hours in 2013 and finished in 12th place in 2014. 2014 – WEC with Oak Racing-Team Asia, 12th Le Mans 24 Hours, Porsche CC Asia. 2013 – 2 wins in the Asian Le Mans Series and 1 win in Porsche CC Asia. 2012 – 3 podiums in Porsche CC Asia. 2011 – IndyCar debut with Dragon Racing, 2 races in FIA GT 1 with Team China. 2010 – Reserve driver for Renault F1 team and 28th in GP2. 2009 – 1 win in Superleague Formula and tests for Renault F1 team. 2008 – 18th in GP2 with a podium finish in Monaco sprint race. 2007 – A1 Grand Prix with team China with one 3rd place. 2006 – 9 wins and German F3 champion. 2005 – 2 wins and 3rd in German F3. 2004 – 7th in German F3. 2003 – Formula BMW Asia champion. 1999 – Dutch Cup karting champion. Formula E: What is FanBoost? 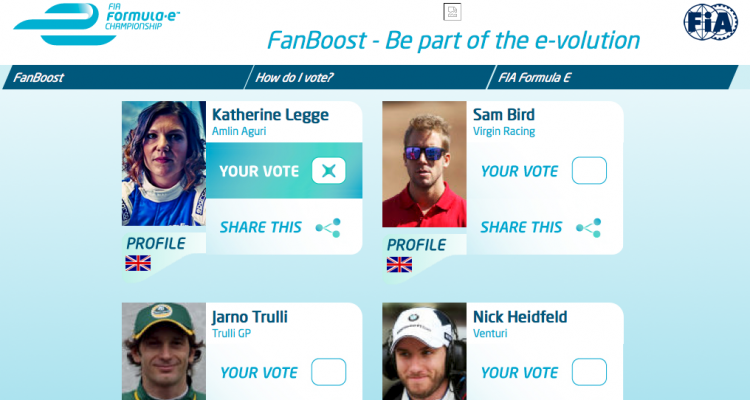 Fans can give their favourite driver an extra speed boost by voting for them prior to the race. The three drivers with the most votes will each receive one five-second ‘power boost’, temporarily increasing their car’s power from 150kw (202.5bhp) to 180kw (243bhp). Votes can be cast online at http://www.fiaformulae.com as well as via broadcasters, sponsors and numerous partners websites including in China. Fans vote for one driver. When does the vote close? The vote closes 1 hour prior to the race. A vote can be changed at anytime up until the vote closes, the final registered vote is the only one that counts. Can the vote be shared? Every time a person votes and changes their vote it can be onto their Facebook timeline, as a hashtag in their Twitter timeline and on their Sina Weibo timeline. The vote closes on the day of the race. The FanBoost recipients are revealed 20mins before the race starts on the official Formula E website and social media channels as well as on Television. How is the vote protected? We are a working with PriceWaterhouseCoopers to independently adjudicate the vote collection and counting procedure. 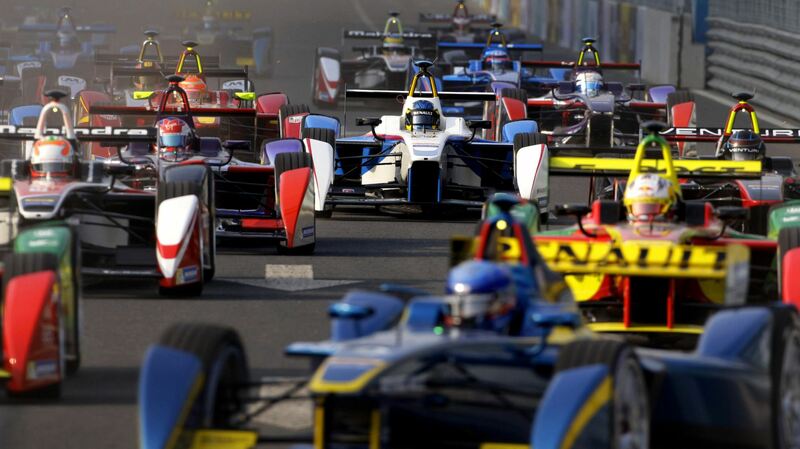 Formula E is here. The first motor-racing championship featuring all-electric cars began its inaugural season in Beijing on Saturday, and it was won in an exciting finish by Audi Sport’s Lucas Di Grassi after leader Nicolas Prost crashed at the final corner. Formula E arrives and takes over city centers for a day, which encompasses practice, qualifying laps, and the race itself. The races only last an hour and each team has two cars—the organizers haven’t quite figured out a way to safely change batteries in one car nor make one battery last the whole race, so there’s a switch halfway through the race. It’s very different than Formula One, which takes place mostly in dedicated racetracks like Monza, where the build-up to the races take place over the leisurely course of a long weekend. The 10 teams have exactly the same cars, unlike In Formula One, where the teams each make their own cars within rules set by the FIA, the world motor-sporting body. The Circuit follows the F1 tire from its Istanbul factory to its home Grand Prix in Monza, Italy.